What do you understand by the term NumPy? A library which consists of a collection of routines and multidimensional array objects to process the arrays is known as Numerical Python, also termed as NumPy. 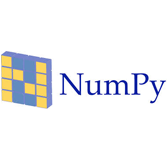 Numpy facilitates in performing the mathematical and logical operations on the arrays. The tutorial covers the basic topics of NumPy including its architecture and the environment. The tutorial also covers some other functions, types of indexing etc. by providing an introduction to Matplotlib. Who are the audience for learning the concept of NumPy? This tutorial is mainly targeted for the beginners who desire to learn the basic-to-advanced concepts and functions of NumPy. This tutorial is mainly useful for the algorithm developers. On completion of this tutorial, one can become an moderate expertise in the concepts of NumPy and can go head for higher level of expertise in NumPy. What are the prerequisites required for learning NumPy? Good knowledge and understanding of the computer programming terminologies is essential for understanding the concept of NumPy. Knowledge and understanding of the programming languages like Python and others will be an added advantage in better understanding the concept of NumPy.